The Catalan company, LARA (Automatización de Prensas S.A.), has launched a new format feed, embossing and cutting line. The line is comprised of a D-5000/1600-MH model winder for coils weighing 5000 kg with 1600 mm outer diameter. 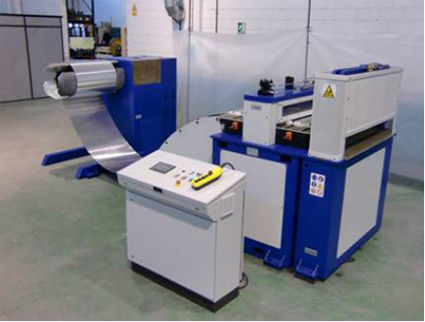 It has hydraulic expansion, electronic speed variator and speed control by laser for perfect synchronism of the embossing speed; a compact feeder – embosser for materials of up to 1000 mm wide and 0.3 mm to 0.7 mm thick, as well as shears to cut the format at a programmed length. This machine is also equipped to directly supply a stamping press. It incorporates a multi-pass system that permits doing different passes with tool combinations to optimise the production process and take advantage of the material. It is a machine that is geared towards the aeronautical, automotive, nautical, and household appliance sectors, among others. It has embossing rollers made of highly resistant steel, with special anti-wear treatment, pneumatic double-cut shears per complete cycle, for greater speed and less air consumption. It is very easy to program thanks to its LCD colour touch screen.